Hazon has created two new scholarships for the Food Conference. The Haas Foundation has funded a scholarship for LGBT folks and their families, and Pursue (a project of AJWS and Avodah) have funded a “Food Justice Cohort” for folks in their 20s and 30s who are passionate about food justice. ...anyone who needs a little extra financial assistance and who is willing to volunteer while at the conference! Complete Scholarship info is available here. Money need not be a barrier to attend the Food Conference. Please consider which friends, co-workers, cousins and other networks you can invite to the Food Conference and share these great opportunities with. Deadlines are approaching very soon. Additionally, prices are rising on June 7. So now is a great time for someone to register for the Food Conference! for four days of learning and celebration! Hands-on food workshops: chop, saute and ferment! 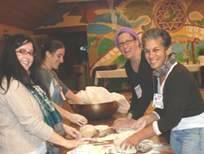 Classes on the 2012 Farm Bill, Writing Recipes, Urban Farming, Intentional Community, Jewish texts and more…. Hazon creates healthy and sustainable communities in the Jewish world and beyond.